​Just about every family has someone who suffers from issues aggravated by poor indoor air quality. We like to think of our homes as havens, but research shows that indoor air can be up to two to five times more polluted than outdoor air. That’s because particles — invisible to the eye, but a hazard to the body — get trapped indoors. Whole-House air cleaner systems remove a majority of those particles from the air passing through your heating and cooling system, so everyone in your home can live more comfortably. 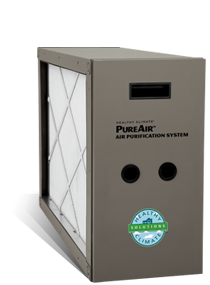 The PureAir system improves air quality throughout your home. No home is immune to air quality (IAQ) problems. Dust. Chemicals. Mold. Mildew. Bacteria. Viruses. Pet dander. These tiny particles (measured in microns) are all very common in homes and they can cause problems that can inhibit the simple joys of life like spending time with loved ones. 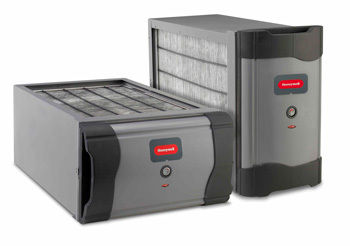 That’s why Lennox has developed the innovative PureAir air purification system. You can breathe easier knowing that the harm you can’t see is virtually eliminated - leaving you with cleaner and healthier air. Particles (any substance measuring less than 100 microns in diameter), Removes more than 95% of particles down to 0.3 micron, including dust, pollen and pet dander. Bioaerosols and Microorganisms (microscopic living organisms that grow and reproduce in warm, humid places) Removes more than 90% of bioaerosols down to 0.01 micron, including viruses, dust mites, bacteria, mold spores and fungi. Odors/Chemical Vapors (air contaminants in the form of gases) Destroys volatile organic compounds (VOCs) and odors from sources like cleaning supplies, solvents used in carpeting or furniture, paints, cooking smells and pet odors.